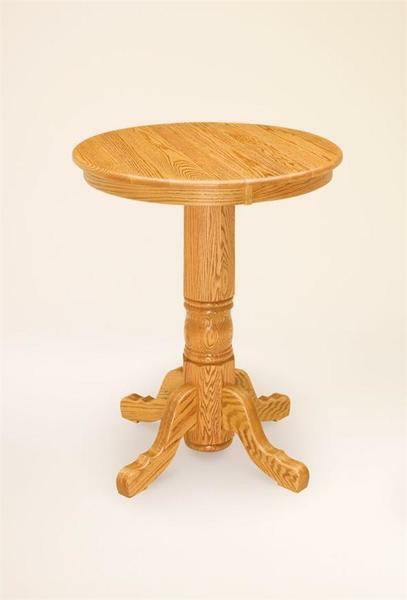 Just right for the breakfast nook or kitchenette, the Amish Traditional Single Pedestal Pub Table is also a popular choice for our commercial customers to use in hotel or restaurant bars. Choose from a wide variety of finish options to customize the look of this Amish made table. There's so much to choose from for your new pub table, and that's one of the things that makes shopping our custom furniture so exciting. Create your version of this pub table and our Amish woodworkers will build it by hand. There's no doubt about it the true craftsmanship and solid wood used for this pub table will make it last--for generations. Email or call our team today with any questions about our pub tables or any of our Amish furniture. Thank you for shopping with DutchCrafters.